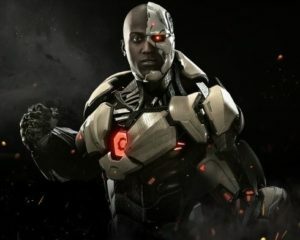 This page contains a character guide for Cyborg in Injustice 2. Here you’ll find movelists, combos, juggles and strategy guides and recommended gear for the Hero character. For more Injustice 2 content, head over to our Injustice 2 top page. What little remains of Victor Stone’s body is protected by Promethium metal shaped into a mechanical exo-skeleton, armed with advanced weaponry and constantly synced to the internet 24/7, allowing Cyborg complete and total access to all information stored in the world wide web. Though his arsenal his impressive, Cyborg’s real talent is his computer skills. Victor can navigate and coordinate massive strikes through his natural connection to the web, and hack through almost any security system and take complete control of it himself, so long as he remains conscious during the takeover. If he is knocked unconscious during, or hacked himself, the feedback can knock him unconscious. Below are combo and juggle inputs for Cyborg , including corner strategies and restarts. He is voiced by Khary Payton, who voiced him in the animated version of Teen Titans and currently voices the character in Teen Titans Go. His quotes also make references to his role in the animated series. When performing Cyborg’s taunt, he says “BOOYAH!” which was his catchphrase in the Teen Titans animated series. He often calls Deathstroke by his real name, Slade, which is what he is referred to as in the Teen Titans animated series.